Alright guys, I’m ready to be done now. I’ve been packing for over a week now and I’m ready for this move to be over with so I can find all my stuff again. We tried to cook last night and it was a whirl of “Where did we put that?” “Can we reach that box?” “Is it worth it? No? 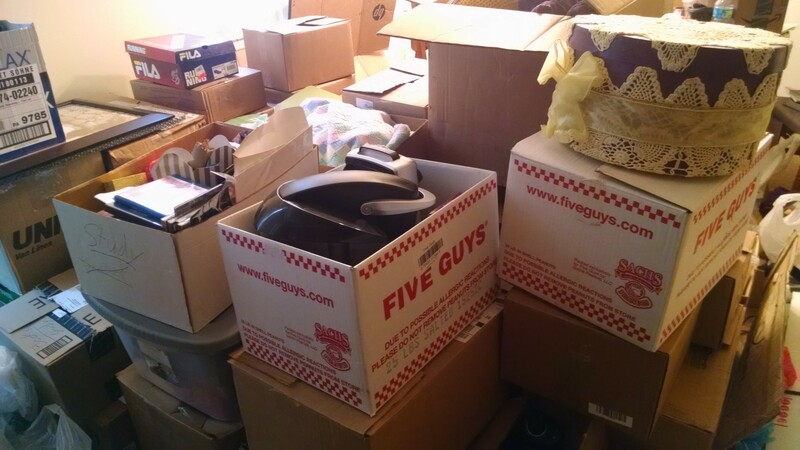 Alright, we’ll make something up.” The piles of boxes have spread to the bedroom and some of them are still sitting in the study, waiting for something, they no not what. It’s been a very long week. Seriously, guys, I don’t know what I would do without my mom. She came down yesterday to help me pack up the bedroom and the closet and a little of the back room and I honestly don’t know where I’d be with this whole packing thing if she hadn’t come down three times in the past two weeks to guide me. I didn’t even know where to start last week. Thanks to Mom, we’re pretty much ready to go tomorrow. Once we tidy up the living room and finish that one cabinet and the back room we’ll be good. Not too much work for one last day. This is it, guys, we’re almost there. We are so close to being in a house! Tonight, sometime, we’ll get the key to our new place and tomorrow we’ll go over and clean up the sidewalk and porch, pick up the moving truck, and the loading process will begin. It’s going to be 8 degrees outside. Yeah, I’m thinking of leaving the guys to load up furniture and taking the girls over to the new place to set up hot drinks and such for when they get there. I really want to have a fire going, but my husband thinks that’s impractical since we don’t know if the chimney is clean or not. I think I’ll try and ask the land lady about that when we get the key. I also have to ask about yard work and gardening. I think my dad wants to put in a garden along the fence. Or at least some flowers. He’s into plants. Today I have to clean up the living room. Mostly it’s just amazon boxes and take-out bags floating around with a few stray knick knacks and books and stuff from Christmas. I didn’t want to put any of it away because we were moving so what was the point in finding a place for it? I might leave them as they are, or maybe tape a box together and throw them all in there. Nothing break-able, just random stuff, already in bags anyway. The fun part will start tomorrow evening, after everything is moved over and we get to start arranging and pulling things out of the boxes. I’m not sure I’m looking forward to the unpacking any more than I was the packing itself. Trying to find everything and give it a new home will be interesting. But, we have so much more space in the new place, so that might help. There will be things we need to get, of course, more shelves and such so we can put things away properly now that we have the space to store them. I’m particularly excited about having a basement in which to store things. That’ll be super helpful for clearing up the clutter we had in the office. Next week will be crazy. We won’t have internet until Tuesday, which means you probably won’t hear from me again until Wednesday, BUT! Wednesday happens to be Coffee With Purps’ one year anniversary! So I’m going to try and think up something special to do for that. It’ll probably be a recap of some kind, because I may or may not be too frazzled from moving to think of anything more creative. We’ll see! At any rate, wish us luck tomorrow, and have a lovely day, my friends.